Cafe Brazil’s Thanksgiving Holiday Hours are as follows: · Regular Hours at all locations on Wednesday before Thanksgiving · University Park is open all day on Thanksgiving · Cedar Springs closes at 6:00 a.m. on Thanksgiving · All locations will open at 6:00 a.m. on Black Friday Have a wonderful Thanksgiving holiday everyone! Visit Cafe Brazil on November 16 for a FREE holiday specialty drink -OR- holiday specialty dessert* with the purchase of any entrée from the holiday menu insert to any customer who shows us that you are a Facebook Fan. You can show us on your smartphone, iPad, iTouch, laptop or bring in a paper copy of our Fan Page. Cafe Brazil wants you to design our new T-Shirt! Dallas’ best late-night hot spot? 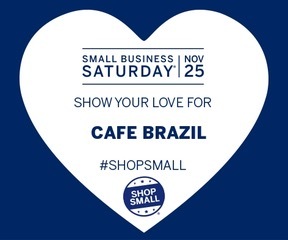 Cafe Brazil on Cedar Springs! Andre 3000 of the Hip Hop Group OutKast, dropped by for a visit to Cafe Brazil’s University Park location.